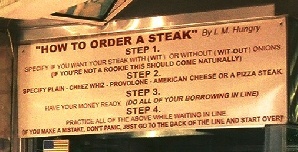 Probably one of the hardest things to do is to describe the taste of a Philly Cheesesteak. It should be noted that there is no steak sandwich anywhere remotely comparable to the Philly Steak. All across the country, and indeed around the world, many make claim to being able to make a Philly Cheesesteak, but this is simply not true. Nowhere outside of the region can this magnificent food be found. There are many imitations, but none come close to the real deal. 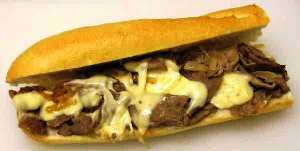 The Philly steak is a combination of delicious,succulent thin layers of steak, smothered with fried onions and cheese (preferably Cheeze-Whiz) resting on a fresh locally-baked torpedo roll. The smell of a cheesesteak is incomparable, teasing the palate, and indeed all the culinary senses in a manner resembling lust. The flavor can only be described as the most glorious taste this side of Heaven. Cheesesteaks can be purchased throughout the Philly region, but two places that are Cheese Steak Central are located in South Philadelphia directly across the street from each other. They are Geno's and Pat's. 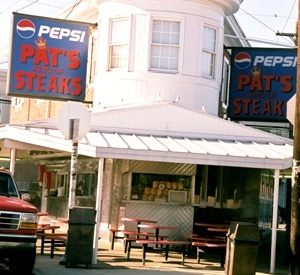 Since 1930, Pat's King of Steaks has been located at 1237 East Passyunk Ave, and is owned and operated by the Olivieri Family. Across the street at 1219 South 9th Street, is Geno's Steaks. 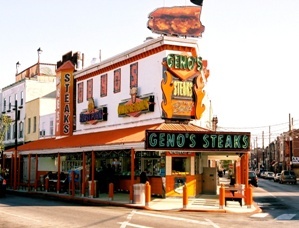 Geno's was opened by Joe Vento in 1966 and still operated by Joe and his family. Both sites have a long history of visits from celebrities and famous people from around the world. Politicians, including Presidential candidates know full well a stop for a Philly Cheesesteak had better be on their itinerary if they want votes.